At this New York gala for The Humane Society of the United States, guests built their own “doggie” gift bags. Shampoos, bowls, toys and more were offered. Heads up! I published this article weeks ago in my e-newsletter. Only today am I re-posting it here, on my blog. But not every article from there makes it over here. So, subscribe to Benefit Auction Ideas (it’s free) to get great content delivered to your in-box. But after working with over 100 onsite and consulting clients in 2012, I have some other forward-thinking predictions for 2013. Not every group offers gift bags to patrons, but for those who do, the “build your own gift bag” concept is clever. One of my November 2012 school clients with a candy-like theme offered guests the opportunity to stuff their own gift bags. They could choose from all kinds of sweets. 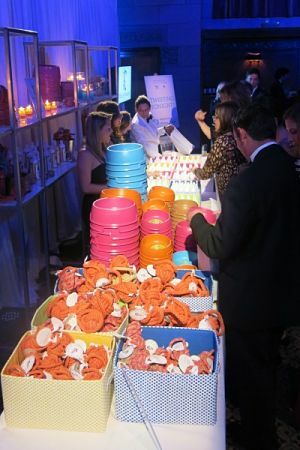 At a December 2012 animal-friendly gala (see photo), guests could build their own “doggie bags” from a selection of eco-friendly pet products by Harry Barker. It’s easier on you … let the guests do the packing. In the commercial auction space, technology has long been used to generate higher sales. But that same technology (e.g. online auctions, mobile bidding) has only slowly been embraced in the nonprofit world. What is it? It means that you’ll allow online bidding during your live auction. I could be sitting in San Francisco watching your live auction occur in real time in New York, and be bidding from my computer on items as they are introduced and sold. Meanwhile, onsite at your event, an attendant is watching my bids (and bids of other internet participants). He raises his hand (or shouts) to let the auctioneer know my bid has been received. Too much to comprehend? It *is* a lot of action! Yet I’ve attended auctions where the auctioneer had three distinct areas to watch for bids. Is it possible that your gala auction could become so high tech that all of this is required? Well … it’s a trend to watch. I’ve talked with two nonprofits who had some exceptional items to sell and this technology crept into our conversation. It would be a longer-range adoption of this technology, but it’s in the cards. 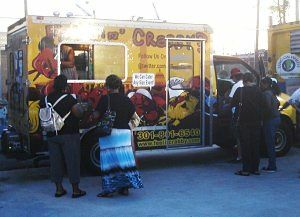 The Feelin’ Crabby food truck in Washington, D.C. serves crab sandwiches and salads. This trend might only make sense for those of us in metropolitan areas. In a number of cities, gourmet food trucks have become the rage. They are mobile restaurants with a limited menu and more upscale food. Trucks might offer Vietnamese food … or Mexican … or cheesecake. For large fundraisers (I’d say 800+) trying to avoid the traditional “sit-down dinner,” using food trucks is a newer concept in feeding people. One of my friends ran a huge (I think it was 2,500 people) event at a hotel in California. he organized it so a number of these trucks (I recall it being 15 or so) drove into the hotel grounds, parked in the exhibit area, and offered food. Guests were given a map so they could navigate to vendors. Would it work for your event? It’s certainly a more casual concept. A nonprofit I consulted with last summer was targeting to have 2,000 people attend its outdoor fundraiser along the river. A small live auction was to be part of the program for the night. Food trucks would certainly work in that environment. Other large-scale, outdoor events would also be a fit. Who holds these types of fundraisers? I often see them benefiting national and state parks, zoos, and “outdoors-y” causes, like environmental centers. (That said, I attended one in Sedona, AZ that raised money for the Boys & Girls Clubs). If this describes your event, consider trucks. I’ll be keeping my eye out for new ideas as I work with my 2013 clients — 26 auctions are already booked. Great tips Sherry. I am currently looking for a job as a fundraiser and honing my skills in internet marketing at the same time. I plan to read your blogs. Yes … perhaps internet marketing is how you can get the word out that you’re seeking a new opportunity. 🙂 It’s marketing yourself. Good luck! Thanks for the “build your own gift bag” idea! For many of the events I work on these bags are getting more popular, and they increase the value of the event tickets when we can publicize in advance what attendees will receive. Glad to see this tip for saving time! Thanks for the share, Renee. I like the publicizing angle. Build your own gift bag is a trend that is very upcoming within the industry. They are a lot easier than packing them yourself, as I have found out recently! By saving time, you can utilise this by getting other tasks done. Thanks for sharing and stopping by the blog, Eleanor!